Vadim Smakhtin, Nikita Pestrov and William McKuster’s Guest Lecture in Prof. Anna Bokov’s History of Future Cities Class. Modern cities are complex systems with multiscale temporal processes at their core: whether it is commuters activity or the working hours of venues. In order to understand and manage such processes we need a radically new approach for their analysis. 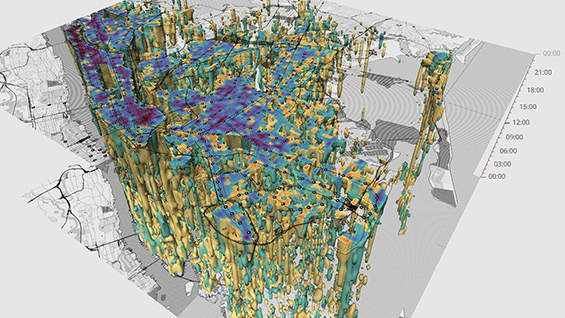 Habidatum explains the theory and technology behind Chronotope, why spatiotemporal analysis is important, and the types of data that are being used to navigate the hyper-dynamic urban environment. Vadim Smakhtin, CTO, Partner of Habidatum, is a creative coder and generative designer focused on hybrid programming tools and interaction between coders, designers and analysts. Vadim is a co-founder of the digital design studio Mathrioshka. He has 6+ years’ experience in digital art and data visualization. Apart from his work as CTO, Vadim holds lectures and workshops on digital art and parametric architecture. Nikita Pestrov is the Data Science Lead of Habidatum which he joined after studying at MIPT, Skoltech and MIT Media Lab. Prior to Habidatum, he established CocoaHeads Moscow, a monthly iOS developers’ meet-up, and also co-founded “easy ten”, a mobile app for learning foreign words. William McCusker covers product strategy, product management and business development initiatives at Habidatum. Prior to Habidatum William coordinated the development of online visualization tools: The Atlas of Urban Expansion (NYU Marron Institute, the Lincoln Institute of Land Policy, and the United Nations Human Settlements Programme) and the Atlas Expansion Urbana Colombia (NYU, Government of Colombia and National Planning Department). Open to current Cooper Union students, faculty, and staff.